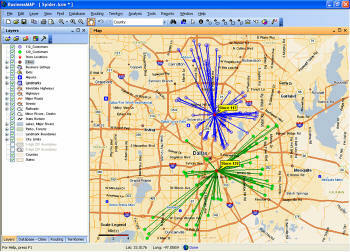 The ESRI Business GeoInfo Summit, a gathering of 200 ESRI business users, took place last week (April 23-25) in Dallas. What I found was most interesting was the diversity in ages of the attendees. Folks in the world of retail development had been getting a little gray, but now I'm starting to see a passing of the baton to new, young people, and that was certainly the case here. What's great about this shift is that these young people, as would be expected, are technically savvy and have the ability to "get it" right away and even better, to apply the technology, solve problems and move the bar. An ESRI representative mentioned that at least 20% of the company's revenue comes from business-related sales. So the company's approach to this conference is very serious. The opening session focused on the technical end of the newest version of ArcGIS Business Analyst. On the technical end, Business Analyst certainly benefits from advances found in the latest version (9.2) of ArcGIS. New features include the Tele Atlas point geocoder, a territory design module, access to premium aerial and satellite imagery from GlobeXplorer, a simplified report module, better data management and updated data. In addition, Business Analyst Server is going to incorporate more and more of the desktop version's functionality (coming this summer to a server near you). The conference addressed innovation and serving the enterprise. Serving the enterprise means more than just accessing a common database. The ESRI folks illustrated this concept with a demo of a "virtual map book," using transparent layers over a map in a pre-GIS "light-table gymnastics" exercise done in a very cool electronic manner. A book appeared in the middle of the screen, so you could "turn the pages" with the mouse and then drag a transparency containing data over the map in the book. The virtual map book made the process of adding, adjusting and subtracting information so painfully obvious, even the CEO could use it. The most interesting application I saw was demonstrated by Jay Lucas, president of STDB, Inc. and a Certified Commercial Investment Member (CCIM). STDB-Online is the most comprehensive commercial real estate site I've ever seen. The CCIM Institute is an organization of commercial real estate professionals; originally STDB-Online was offered exclusively to its membership. It now can be accessed through subscription or on an ad-hoc basis by anyone involved in real estate. It includes the usual demographics, thematic maps, graphs and reports. In addition, there are real estate contacts, "comps" (what similar properties sold for), construction information, office demand - in short everything anybody in real estate would want to know in any market in the US. It is truly an amazing site. There is a tutorial on how to use the site, which is fairly in-depth (three hours or more). But the site is very intuitive; you can figure out how to use it by yourself. There is even a module for creating site plans, which are packaged up and sent to you in standard CAD formats. The Summit's plenary session included a presentation by ESRI's Deana Henderson about using Business Analyst as a collector of intellectual property for Business Continuity Planning (BCP). This is particularly interesting in this time of "baton passing" in this industry. There is a need to capture the knowledge of key personnel in Business Analyst as a means for modeling performance and viability, and for understanding some of the subtle assessments made in the field. This collection of intellectual property can include not only characteristics of site selection, but also information like disaster pre-planning - understanding the nature of revenue loss caused by simple circumstances like managers not being able to get to work and the losses resulting from not being "open." If the "system" knew what people know, enlightenment could spread across the enterprise, especially as baby-boomers move on. There were a number of great presentations showing applications from retail to healthcare to insurance to franchise management. In several cases, new (read: young) people had come into their positions without any prior knowledge of GIS and had found a dusty box of software that no one knew how to use. They figured it out, got it going and then wanted more. This was true for Stefan Fromm of Great Harvest Bread Company, and Joel Speakman of Dupont Performance Coatings, who both gave terrific presentations. The common element was the ability to do serious spatial analysis, modeling, sophisticated customer/market analysis and ultimately deliver a set of solutions that more than justified the cost of owning these systems. The previously mentioned virtual map book gets my vote for the coolest thing at the conference. It was almost magical how you could drag a transparency over a map and see the data appear. 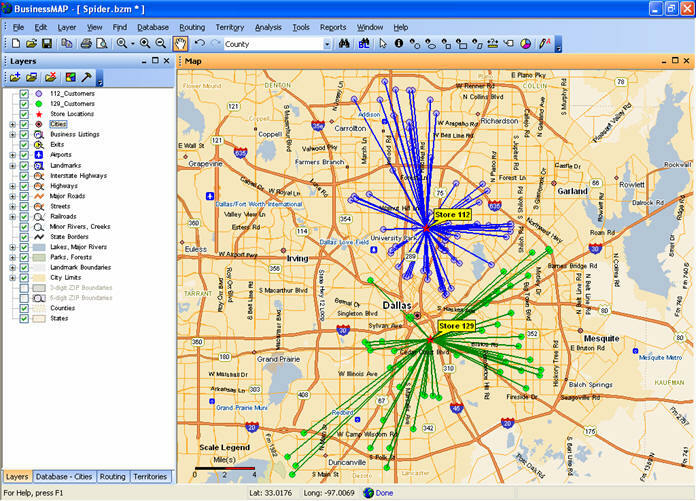 Another really nifty piece of technology is the Spatial Calculator in BusinessMap 4.5. It is especially great for balancing territories by selecting geographies and seeing the new totals (sales, population or other variables) appear. It's one of those features that is such an obvious addition, you wonder why you haven't seen it before. This conference featured diversity of users, not just across age, but also across industries. I appreciated having access to such gurus as Dr. David Huff, an ESRI Technical Advisor who is famous for the "Huff Model." There were at least a dozen or more ESRI people facilitating introductions, answering questions and naturally, showing off software. But this was not purely an ESRI software-centric conference - it was about doing real work, making real contributions and finding real answers.